Sarcoids – The veterinarian’s challenge. Once corrective measures are taken, the virus may travel to other points and come back more aggressively. For the horse owner, this virus can be devastating. Sarcoid Salve Will not burn, heals hot spots and eliminates tumors at their source. Sarcoid Cleansing salve pulls the virus from the bloodstream. Recommended as a pre and post-surgical emollient. Use as a preventative measure so that a sarcoid tumor will not reappear. Sarcoid Cleansing Salve is the new, safe way to establish an aggressive, painless and effective treatment of this ever-increasing problem. 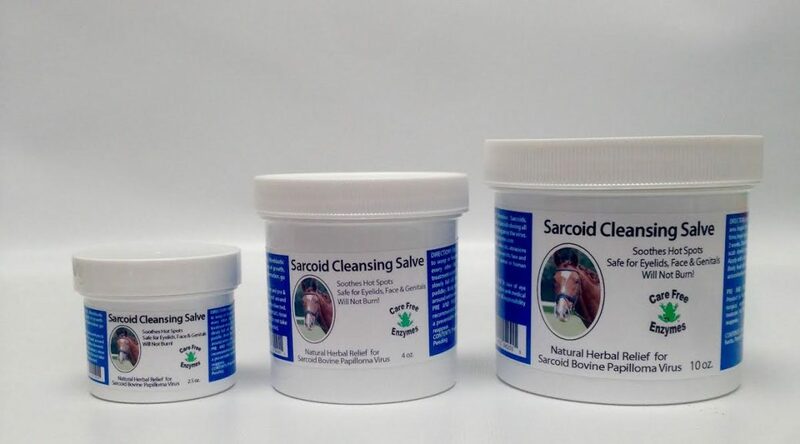 The Sarcoid Cleansing Salve is specifically designed to help clean the underlying cause of the condition through topical application. Our product is made from natural compounds blended to perfection to treat this condition. Sarcoid Salve also helps to eliminate re-occurrence at the sight, or eruption at competing sights elsewhere in the body.